M.Sc. Occupational Therapy is a 2-year full-time postgraduate course in Occupational Therapy science. The eligibility criteria for the program is passing B.Sc. or Bachelor’s degree in Occupational Therapy with a minimum of 55% and above from a recognized university. Admission to M.Sc. Occupational Therapy program is conducted on the basis of Merit. Furthermore, certain colleges and universities may conduct their own entrance examination for selection of candidates followed by counseling. The program primarily deals with health and its various aspects aiding individuals in leading a healthier life without any hassles of mental or physical illness. The course deems to offer students the required training and guidance in order to inculcate in masses the aspects of leading a balanced lifestyle. M.Sc. Occupational science provides the students a comprehensive view of Health therapy which blends together mental as well as physical health. The course is apt for applicants who have in them the healing characteristics, who are empathetic and envisage to provide help to people in need of health support. They should imbibe in them the zest for treating, listening without judgment and developing a good interpersonal relation so that the patients can open up to them about their issues freely. Having the knack of getting to the crux of the subject thereby providing required guidance and the ability to work around the clock and challenging situations is a must trait required in candidates. The program fee in India ranges between INR 6,000 to 2.40 lacs for a span of 2 years. Post Graduates who have finished their course successfully have the competence to be hired as Occupational Therapists, work for NGOs, Health Clinics, Nursing Homes, Health Services Homes and much more. The average remuneration attained by candidates after passing M.Sc. Occupational Therapy ranges from INR 1 to 12 lacs per annum. Top Recruiting Companies Defense Services, Hospitals, Clinics, Health Care, Schools, Nursing Homes, etc. Job Positions Medical Record Technician, Occupational Therapist, OT in-charge, Service Delivery Manager, Teacher, Critical Care Nursing In-charge. M.Sc. Occupational Therapy: What is it About? The niche of Occupational Therapy deals with treating and helping individuals who are going through mental and physical trauma so as to retain back the balance in their life. M.Sc. Occupational therapy offers students a sneak into the advanced dimensions of Health Sciences and an in-depth understanding of the various services which are implemented to accomplish the goal. Candidates are made adept with the aspects of health science to cure ailments and rejuvenate health. The program covers various dimensions of Medical science, in order to help them achieve the highest functioning in their daily lives freeing them out of stress. Candidates are given an intrusive look on its effect on children, for improving motor skills, physical and cognitive abilities as well as enhancing their self-esteem for performing well in their mundane activities. They are rendered a platform to polish their interpersonal skills of communicating with clients, to build a rapport with patients and together go on the mission of achieving the goals. M.Sc. Occupational Therapy course lays the ground for pursuing higher qualification such as M.Phil and Ph.D. in the field, by instilling in them the characteristics of customizing the activities, evaluating the goals and its reach. The curriculum of the program is constructed in accordance with the need of the course so as to build in them the acumen to an in-depth understanding of the subject. M.Sc. Occupational Therapy course introduces the concepts of study through theory and practice. This also involves attending seminars by eminent experts of the field to get a deeper view of the field and its working. The program offers students an integrated output to impart the required knowledge of the subject and understanding the vast detail of occupational therapy science. M.Sc. Occupational Therapy offers candidates a wide range of options to choose in the field of Health Sciences. They can choose their career in Hospitals, Clinics, NGOs, Schools and much more. They also have an opportunity in the private and government sectors. The overall aim of the program is inculcating in candidates the necessary skills and proficiency to become professionals in their field as well as emerge as responsible citizens. Those who have passed their B.Sc. or Bachelor’s degree in Occupational Therapy with a minimum aggregate of 55% and above from a recognized university. Candidates should have completed at least 6 months of compulsory internship. Certain colleges and universities may conduct their own entrance examinations for admission of candidates. Admission procedure for M.Sc. Occupational Therapy is done on the basis of Merit secured in the qualifying examination. The eligibility criterion for admission is passing B.Sc. or Bachelor’s degree in Occupational Therapy with a minimum aggregate of 55% marks and above from a recognized university. In addition, candidates are also required to pass the various entrance examination held by different universities and institutions. This will be followed by counseling conducted by respective universities and institutions. However, the eligibility criteria may differ for different colleges. The admission is done on calculating the cumulative marks obtained in qualifying exam and entrance exam based on which the merit percentage is deemed for the program by respective colleges. MET 2019 – Manipal Entrance Test 2019. Applicants can apply for the program either through online or offline mode. All the important data pertaining to admissions, entrance test, and selection of students will be notified through email or listed on the official website of the college. M.Sc. Occupational Therapy is designed with a view of providing candidates the necessary criteria for understanding the subject in depth as well as preparing them for pursuing future qualifications such as M.Phil and Ph.D. in the program. The course details on the comprehensive evaluations taken up for guiding the families and patients in easing their life. ** The Syllabus of the program may differ for different colleges. Graduates after the successful completion of M.Sc. in Occupational Therapy are competent to explore their knowledge in vast dimensions of field related to Health Care and Child Development. This includes employment areas surrounding Hospitals, Clinics, Universities, School, Nursing Homes, Medical Writing, Defense Services and much more. 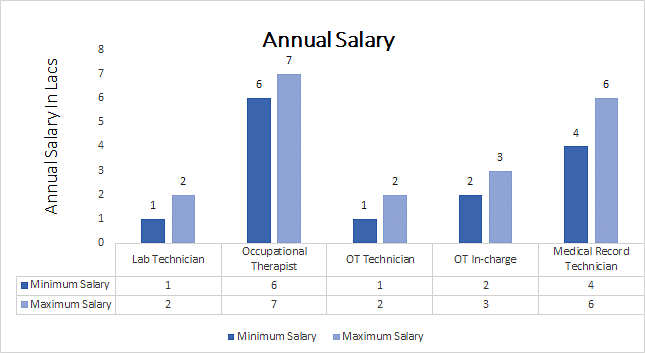 They can choose their occupation in the areas of OT In-charge, Occupational Therapist, Lab Technician, National Sales Manager, Critical Care Nursing In-charge, OT Technician, Medical Record Technician, Service Delivery Manager, Teacher, Professor, and other such.